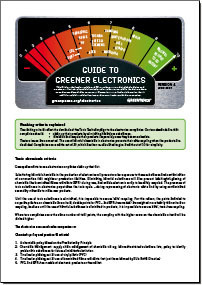 " The fourth edition of the Greenpeace Guide to Greener Electronics is out now. Apple moves up as a result of Steve Job's "Greener Apple" pledge to phase out PVC and other chemicals from their product line. But Nokia is on top because they've already phased out PVC, and met or exceeded a wide set of benchmarks we've laid down to reduce the amount and toxicity of electronic waste piling up in Asia and Africa. "